The term "knockout" comes from printing and means that instead of overlaying an image on top of another one, you remove the area where the images overlay, leaving a blank spot so the top image now overlays direction on the paper beneath. In Photoshop, knockout means setting one layer to cut a hole into all the layers beneath it, except a flattened "Background" layer. You can harness the power of knockout styles for advanced blending and for making quickpages! 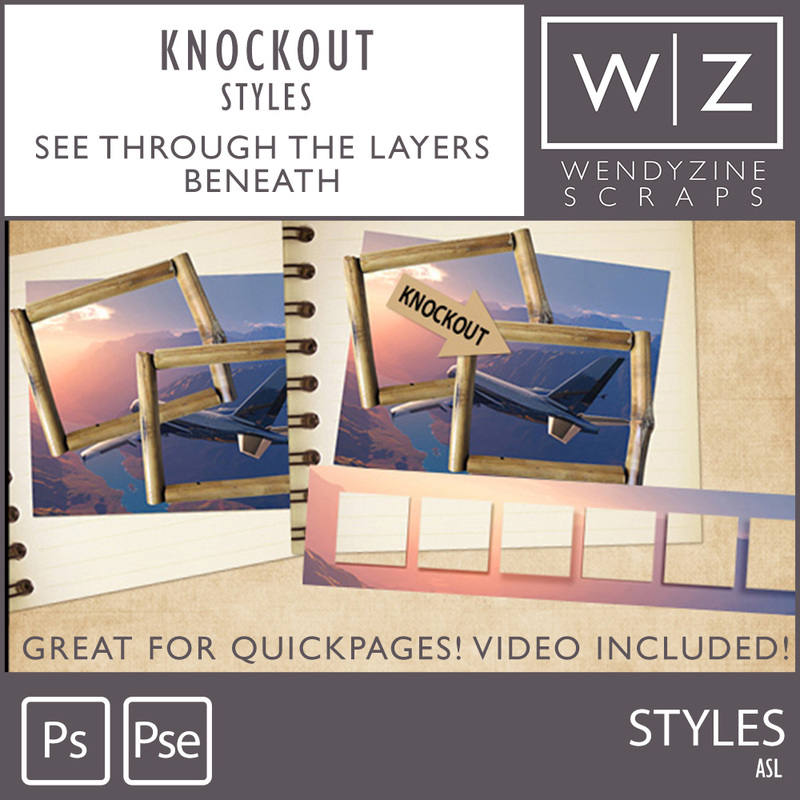 This massive set of styles include knockouts with and without black or brown shadows (with many shadow depths to choose from). And, they come in both Deep and Shallow. Understanding deep and shallow will allow you to harness the power of knockouts, so I've included an instructional video to help explain the difference and how to use it to your advantage. TESTED in PSCC+ and PSE11+ ONLY. Mac and PC Compatible. PSE USERS NOTE: PSE does not support layer groups. So, although you can apply the knockout styles, you will need to merge any knockout layers prior to working with them further. This is not covered in the video. You'll be able to use the styles for quickpages without any trouble. But other uses of the styles will require creative merging of layers in between steps.